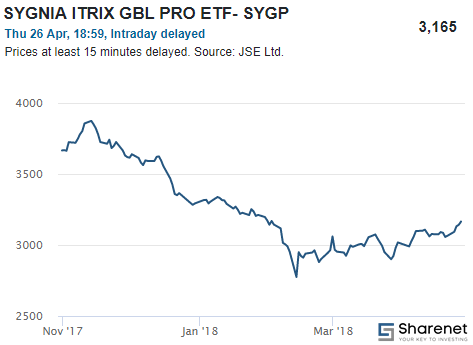 In this, the final installment of our six-part series profiling four domestically focused and two foreign focused property ETFs listed on the JSE, we turn our attention to Sygnia’s Itrix Global Property ETF (SYGP). 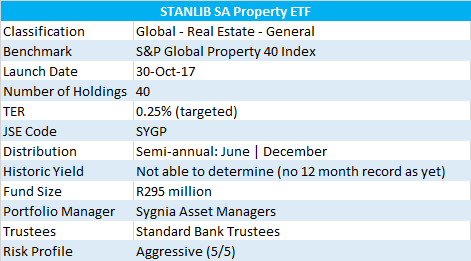 In week three of the series we shone a light on the CoreShares S&P Global Property ETF, a direct competitor to Sygnia’s Global Property ETF. The SYGP ETF was launched on 30 October 2017 and will therefore have a six month track record at the end of April 2018. �The ETF has a market capitalisation of approximately R295 million as of market close on 26 April 2018. The Sygnia Itrix Global Property ETF is a high-risk, passively managed portfolio of listed global property shares. The objective of this portfolio is to provide convenient and cost-sensitive access to the underlying assets contained in the S&P Global Property 40 Index. For the individual investor, no transfer of rands into foreign currency is required, as the asset management team handles all the offshore buying. Simply purchase the ETF through your local stock broker and the rest is done for you. It really is a fantastic way of gaining exposure to the world’s top forty biggest (by market capitalisation) property stocks, mostly, REITs. The investment policy of the portfolio is to track the index as closely as practically and feasibly possible by buying securities included in the index at similar weighting. Whenever the index is rebalanced, the portfolio will purchase the newly included constituent securities and will sell the constituent securities which were excluded from the index at rebalancing. 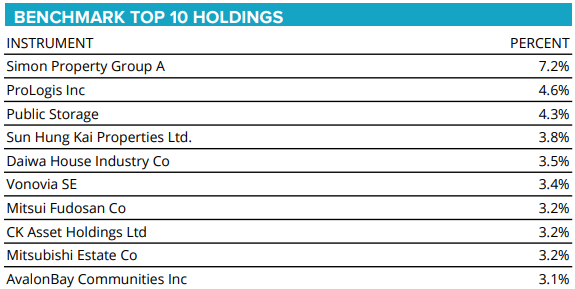 Many of the names on this list will be unfamiliar to South African investors, but are in fact among the biggest property companies in the world. I have said it before in previous articles, but it is worth saying again: with the JSE property sector made up of mostly retail, industrial and office REITs, it is a refreshing value-add that the global property option adds a further 13 sub-sectors to property investment. ProLogis, for example, is a logistics REIT, while Public Storage is a self-storage REIT with an impressive track record. The geographical spread makes for interesting reading and adds to diversification on a regional basis and across currencies. The dominance however of the US allocation will require of the investor to carefully consider the case for REITs in the United States, as swings in the underlying shares listed there will have a major impact on the portfolio. It is one of only two ETFs in our series that tracks a Global Property Index, the other being the CoreShares S&P Global Property ETF mentioned in the opening paragraph. The TER of the CoreShares version is 0.5% compared to the 0.25% targeted TER of the Sygnia version, making the SYGP ETF, in respect to costs, half the price. However, until one year of track record has been achieved, the TER will not be an accurate number. What type of investor/portfolio would benefit most from holding this ETF? With just under six months’ track record, this ETF really hasn’t been around long enough to make any judgement calls. The period since launch has been a rough one for Sygnia and in many ways, was an unfortunate inception date. The listed global property market has been a laggard during this period generally. The share price is down 18.8% from its high in November 2017, but those shrewd investors who picked up the stock at its low in February, are over 9% up in just over two months.